Last October, the afternoon of my father-in-laws funeral in Truth or Consequences, NM, I went for a long walk. I knew I was leaving New Mexico the next day, returning to a grey and rainy Portland. And the day’s events had me in a mood, understandable I’m sure. I’ve saved these sunny saturated photos, knowing they’d be just the thing to warm my soul on a cold grey day in January. I hope they do the same for you. This is a vacant lot just a couple of blocks from my in-laws. Andrew and I went exploring there together. A friend's friend identified it as Echinocereus fendleri var. rectispinus, another said possibly Echinocereus triglochidiatus. While I did bring home a few opuntia pads from that trip none of them were from this plant. Wow…that’s some serious spikes. This little Tephrocactus articulata ssp. papyracantha (I think that’s the proper name) was the smallest thing planted in a well done xeric garden we drove by many times. I wanted to photograph it because even though it’s so small those long white papery spines glowed and it commanded attention. Such an odd little wall made even stranger by the top layer of rocks. These opuntia were growing thick on a bank next to the road. There was a house back there but you could hardly tell. Not all of them looked so healthy and plump however. It was fascinating to see the interior structure of the dried up pads. I guess they don’t really care if you’ve got the entire phone number for the Rock? I wanted to get close to this lush blooming ocotillo but it was in someones yard, and there were dogs. Cylindropuntia leptocaulis or Desert Christmas cactus. There are a few of these old street lights in Truth or Consequences, I live the colors. Suddenly I felt like I was being watched. Very much not dead! This may have been the healthiest palm in the whole town. This rock fortress is protecting a tiny little seedling. Someday it will hopefully outgrow its container. The sun was flooding these plants with the most amazing light, I figured there was no way I'd capture it with my good ol'point-and-shoot but I had to at least try. Whenever you post pictures of your in-law's town I get an isolated feeling of a place lost in time. I'm not meaning to be negative. The images just seem to tell more of a story than the written word. Your written word ( an isolated feeling of a place lost in time) is a perfect description. Seeing sun drenched plant photos never fails to cheer up a plant lover on a grey winters day! That dead cacti with holes looks so spooky! I wonder if desert creatures live inside those holes? The desert landscape is so alien looking to someone who's always lived in places noted for being covered with green! Very beautiful, warm, and dry looking. Perfect for a wet and blustery winter day like today. Thanks for that! You really need to visit the desert someday Peter. Not T or C (it's charms are less than bountiful) but maybe Santa Fe, or Tucson. Just lovely. Everytime I see photos like these, I want to move to the desert. And I swear, someday I will! You and me both Gerhard. 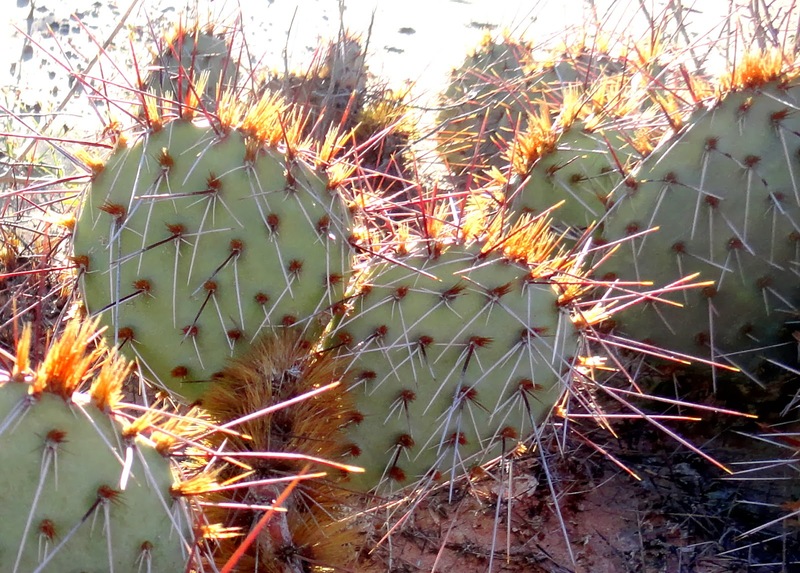 That is one prickly place , very unusual .love the photo of the prickly dead plant. I love my father-in-law dearly, he is a very decent bloke and I would be very sad without him. I like your photos, there's something quite poignant about them, particularly given the day's events. Your shots captured your mood that day. I'm sorry for your loss. And thanks for a bit of sunshine on a rainy day. Gorgeous shots, especially that last one! Fascinating place and the sunny photos are so appreciated this time of year. There's a repeated linear theme with the light rays, contrails, and spiky plants which is very calming. Oh, Danger! I needed that! I love the albizia palm ;). That one washingtonia sure looks nice too! Thanks for the sunny warmth! Yes, the lighting is incredible--especially the back-lighting in that last photo. Thanks for the light treatment. I really needed it after the cold blast of last week. The Cactuses there are incredible! I wonder if the Albizia palm is as messy as the regular kind ;). Sorry to hear about our father in law, Loree. The shots of death and desolation truly captured your sorrow... I think I need to visit the desert SW some day, but I'm such a shade creature. Somehow, I think I'd end up as a pile of blanched skull and bones once I leave the protective canopy of the PNW. Just imagining it makes my skin itch, but I love watching vicariously through photos - especially on a dark, rainy day. The shapes and the shadows are marvelous indeed.